“A lot” can mean different things to different people, so allow me to provide some scale. I have 7,456 photos on my hard drive from last year alone, and that does not include photos I deleted from my camera or computer because they were subpar or out of focus. It was worse in 2012–I took over ten thousand photographs that year. I really enjoy taking photos. The act of metering, focusing, and taking a photograph forces me to see the world in ways I would not otherwise. I always struggle, though, with spending so much time and energy on photographs that are seen by so few. Recently I began organizing my photos into photobooks. I have made photobooks from two family trips in the past, but those books do not include random day-to-day photos that I have taken and really love. This year I decided to make a book of my favorite photos from 2013. I had originally planned on just the top 100; but, after a first pass of narrowing down the gallery, I had over 500 photos. In the end I figured: the more the merrier! Many of these photos come from different events or excursions Jessica and I went on during the year. We already have some fun ones planned for 2014 too! I couldn’t upload the entire book, so here is a collection of some of my favorite page spreads. Don’t miss the owls and the DIY dining room table top! This whole process took a significant amount of time. It was so much fun, though, that I am going to go back and make a book for 2012 and maybe even 2011. Last week, I wrote about how Tyler and I took on the task of organizing all of the art we had lying around our apartment. While most of the larger pieces found their way onto the gallery wall in our office, we still had a number of smaller images left over. Unfortunately, all of the other shelves, counters, and flat surfaces in our apartment were already full. Thankfully, we had one bare wall left in the hallway leading to our bedroom. While we considered creating another hodge-podge of frames there, I felt strongly about doing something different… getting creative…mixing it up, which is when I remembered a project done by my favorite DIYers, John and Sherry Petersik from Young House Love. 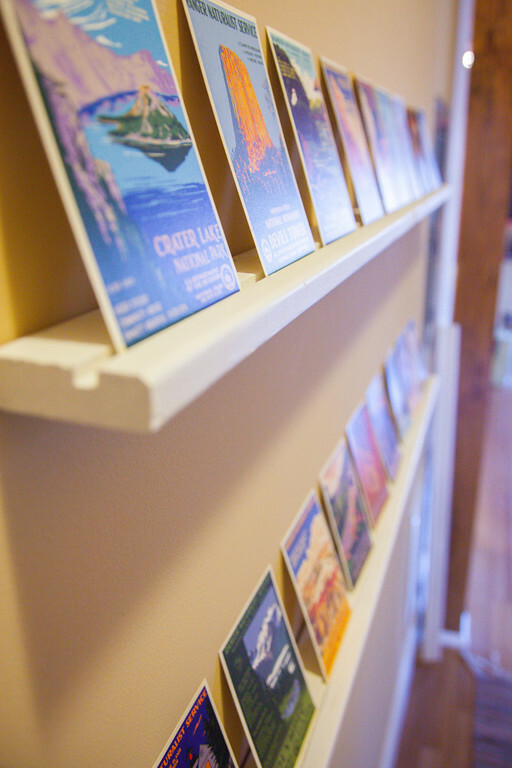 Way back when, when I first started reading their blog, I had come across a post about creating “postcard ledges”. As it just so happens, Tyler and I not only had these leftover pictures, but we have also been amassing a number of postcards: some from our own travels, friends’ save-the-date cards, etc. 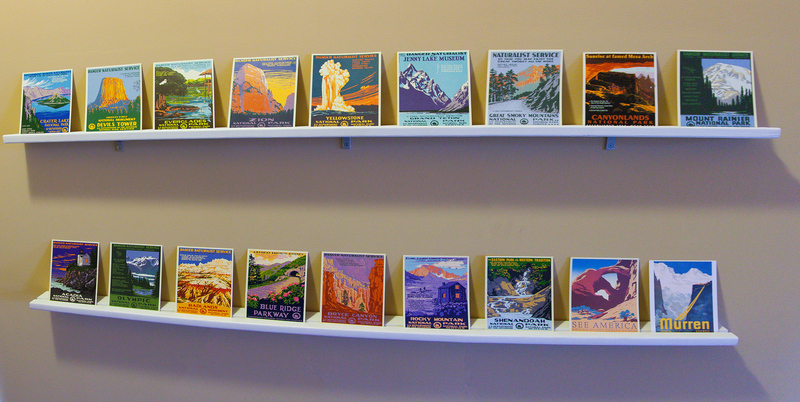 We also had become obsessed with National Park artwork and found these awesome (and affordable!) postcard images we wanted to display in our home. Needless to say, our fridge and our office floors were becoming quite crowded, and postcards ledges seemed to be a perfect and unique solution! 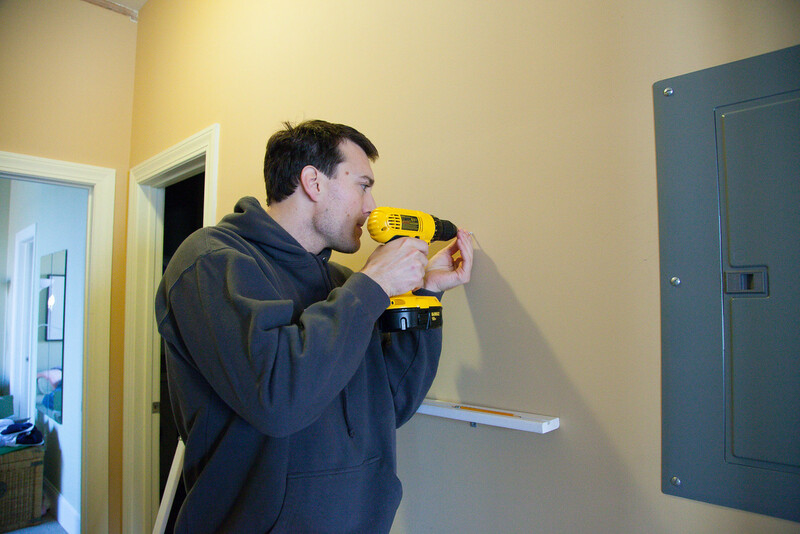 Unfortunately, upon re-reading John and Sherry’s instructions, I realized I was missing one very important tool – a ROUTER. Grrrrr. Of course, I did not let this defeat me and quickly did some research, looking into how much it would cost to obtain one. I realized that a good router could cost me over $200. Second grrrrr. Not to be defeated once more, I persuaded one of my colleagues (another wood-working enthusiast) into helping me figure out a solution to the “no router” issue. After a little discussion, we concluded that I could use the tablesaw in my school’s woodshop. If I set the blade low enough, it wouldn’t cut through the entire board. Instead, it would create a groove, just what I wanted! Armed with a plan, I headed to Lowe’s to purchase my wood and the other materials I “wood” (hahahah) need. I ended up buying a 12′ long piece of 3″ x 1″ pine. Using the big saw at Lowes, one of helpful employees cut the board into three 4′ sections, which Tyler and I had previously determined to be the desired length of our shelves. Now, it would be unfair of me to say that the project went smoothly from there. It should have, but…it didn’t. Silly me forgot that it would be a good idea to use the helpful guide on the tablesaw to keep my wood straight as it ran through the saw. Therefore, my first attempt at creating a groove with the tablesaw turned out crooked – literally! Finally, to remove the remaining slits of wood in my groove, I went back and positioned the guide at 7/8″ and then 1 and 1/8″ – measurements right in between the cuts I had already made. The results were beautiful! These are the boards (w/grooves) after one coat of primer. Having perfected the process and not wanting to waste my materials, I flipped over the board I had originally worked with and made new cuts on the opposite side, placing my “uh-oh” on the underside of the board, close to the wall, where it would remain relatively unseen. Finally, I sanded, primed and painted my ledges, which was relatively easy because Tyler and I own a sander and we had some leftover primer from an earlier project. Therefore, all I had to do was purchase a small sample size container of Valspar’s “Ultra White” paint (~$3). With the ledges finally ready, we decided how best to mount them. After quick discussion, it turned out that my mess-up must have been fate, because we concluded that two ledges would look better than three. We also decided to use a mounting technique different from John and Sherry’s. 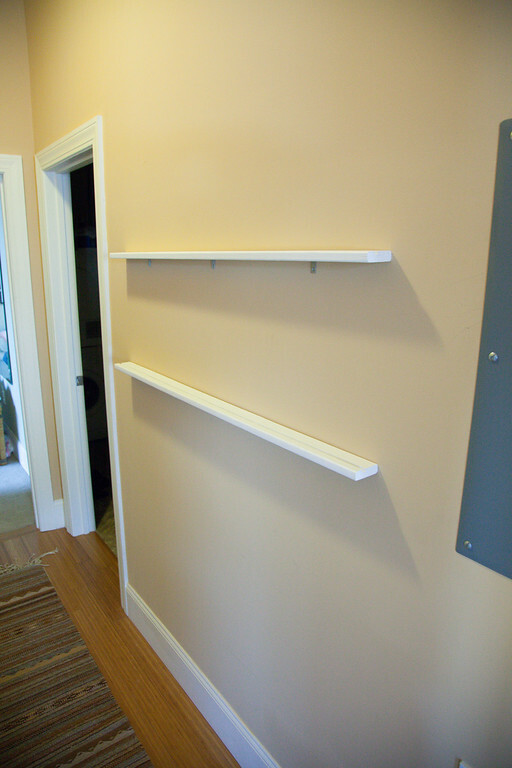 …we purchased several 1″ corner braces at Lowes. 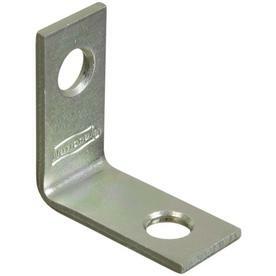 One end of the brace would sit flush with the wall while the other would hide underneath the ledge, keeping it upright. After affixing three braces to the underside of each ledge, we quickly and lightly marked the spots where each brace should be screwed. Then, we drilled a pilot hole at each spot, and hammered in the anchors. As you can see from the pictures below, we started with the bottom ledge, and worked our way up. Drilling a pilot hole for the anchor. 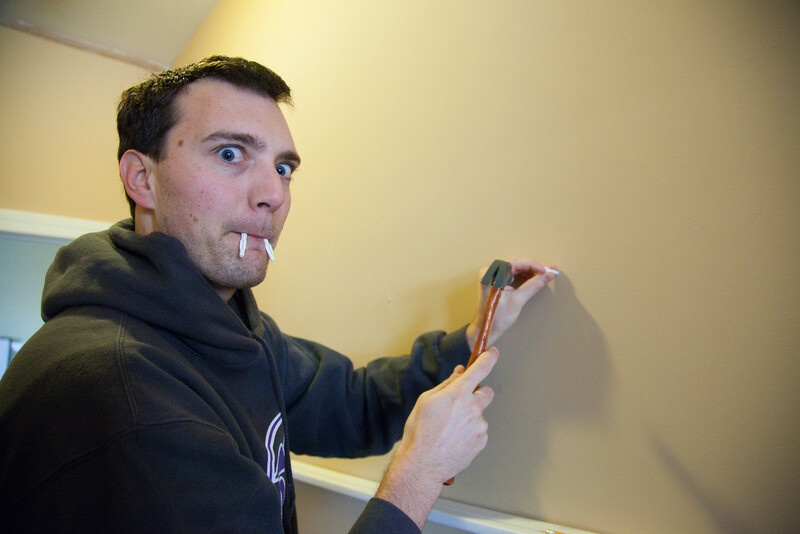 Hammering in the anchor…and pretending to have fangs. 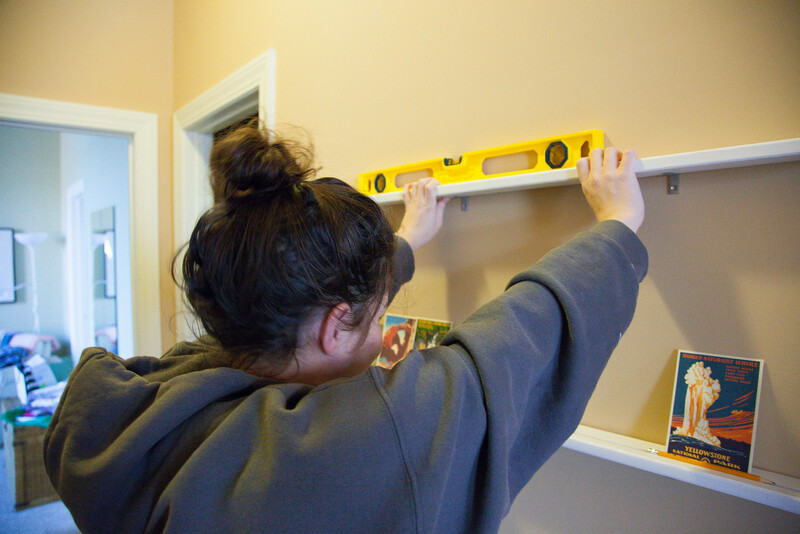 Aligning the ledge with the anchors…and making sure it all stayed level! We loved it, but of course, we also had to see what it looked like filled with pictures! 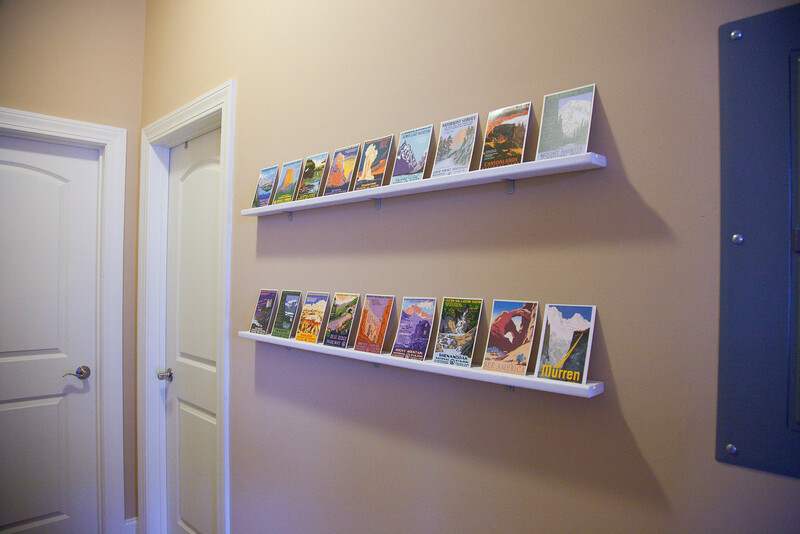 So, we busted out our collection of National Parks Postcards that Tyler had ordered about a week ago. 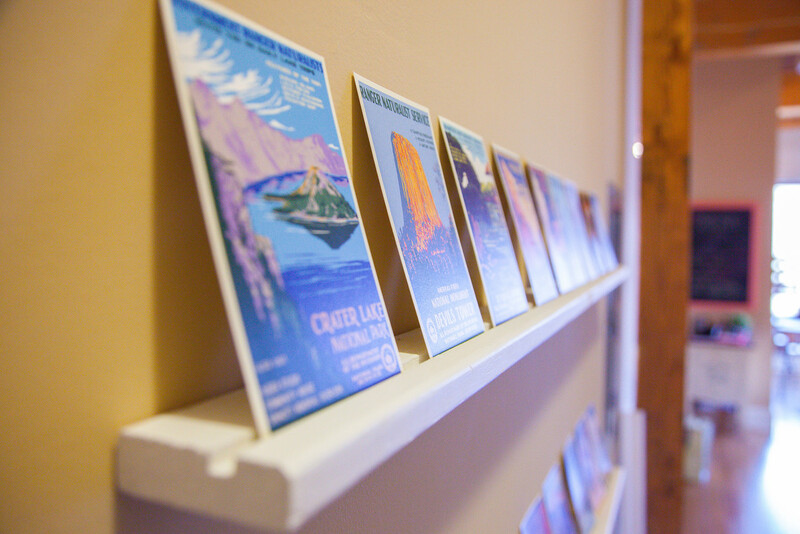 Each postcard represents a park that we have been to together or will be visiting this summer. Pretty gorgeous, don’t ya think? In spite of our original plans to use both pictures and postcards, I’m fairly certain that both Tyler and I are absolutely in love with the collection we’ve got up on the wall right now, and wouldn’t change a thing about it. As you can see, the colors in the National Park postcards are gorgeous (my new favorite word). They pop against the neutral colored walls and ledges. We’re in talks about mounting the postcards on some thicker paper, like cardstock, so they don’t bend or warp. But, we’re going to wait a bit to see if that actually happens. Jessica and I drove home to Connecticut this past weekend and had a chance to enjoy some beautiful snow. It was the thick-flake variety that floats down extra slowly: the type where you can actually see the crystals as they fall. It was wonderful to get home for my mother’s birthday and to see some of the family. My sister and my niece Marley were in town visiting too. Cute kid + awesome snow = impromptu photo shoot! After a little coaxing, I was able to get Marley outside and get a few shots. I dialed my F-stop down to 4.5 to try to get some bokeh from the out of focus snow. It worked in a few of these photos, and I will give it another try later in the winter. I am hoping to go on a winter photo shoot one day in my new snow shoes. The beautiful snow came down all day and night. That inspired Jessica and me to do to a quick re-theme of the BSotT Header. We hope you like the falling snow!